Using an Altera’s 28nm based processor, the V5031 PCI Express card from AdvancedIO Systems promise to deliver a fast ethernet data transfer for professional uses like Sensor and radar systems and Network security/monitoring. 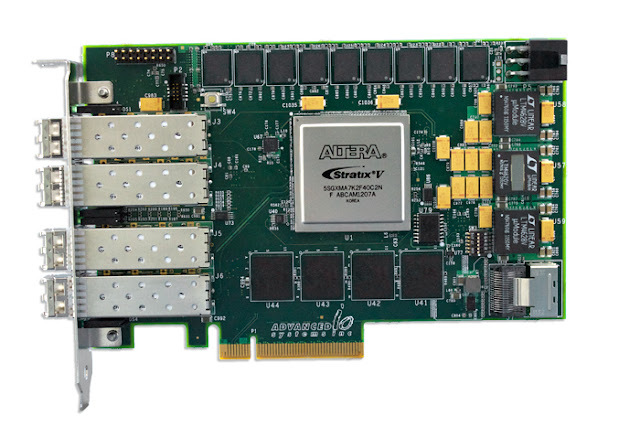 Advanced IO Systems today announced the fifth generation V5031 design at the Low Latency Summit in London based on the newest 10GE network cards technology and featuring a Quad 10 Gigabit Ethernet SFP+ optical ports, with two 8GB 72-bit wide DRR3 SDRAM memory banks and four 144Mb 18-bit wide QDRII+ SRAM memory banks, capable to deliver a high-speed with an ultra low latency, bellow the press release and specification of the product. The V5031 is the fifth generation of our flagship programmable products featuring four 10GE optical ports, a scalable Stratix V FPGA, and advanced memory configurations. It is ideal for implementing trading strategies, risk controls, and a wide range of algorithms as close as possible to the network. To meet priority deadlines for rolling out new financial services, the expressXG development framework provides the standard toolset and debug capabilities required to work with our FPGA network cards. Experience the satisfaction of having all network, memory, and host interfaces functional right out of the box.